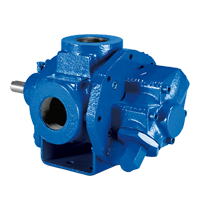 The Gorman-Rupp G Series medium duty rotary gear pumps are designed to handle clean liquid applications usually reserved for more expensive, “heavy duty” pumps. 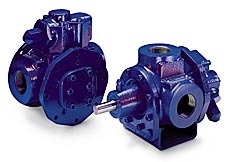 The compact close coupled GMC and the stub shaft, flex coupled GMS – Medium Duty G Series Rotary Gear Pumps offer the quality features found on all G Series pumps, as well as performance and adapability features that are unique to our medium duty line. The GMC Series medium duty rotary gear pump is designed for applications in the operating ranges noted below. Direct connecting to other pieces of equipment provides an extremely compact system design. The six sizes of Gorman-Rupp close coupled pumps connect to standard NEMA “C” flanges. Rotor shaft bores accept standard motor shafts; 5/8” standard, 7/8”, 1-1/8” and 1-3/8” are optional. Metric coupling also available. At synchronous speeds, extra drive equipment, including couplings or outboard bearings, is not required. For continuous service, or for handling viscous liquids, see the heavy duty GHS section. The Gorman-Rupp G Series™ line of positive displacement Rotary Gear Pumps is designed to provide performance no other gear pumps can match. 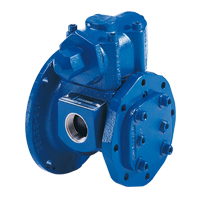 Available in Medium Duty, Heavy Duty and Extreme Duty models – in cast iron, cast steel and stainless steel. G Series Rotary Gear Pumps are versatile enough to handle virtually any pumping application and liquid type. Rotary Gear Pumps come in a variety of drive arrangements, including close-coupled, flex-coupled, gear reducer andv-belt drive. G Series Rotary Gear Pumps are manufactured with patented features that enable them to perform better and last longer on countless applications, providing quality and reliablility that makes the G Series Rotary Gear Pumps the premier gear pump in the industry.